This is the prettiest, easiest, lovliest new earring! 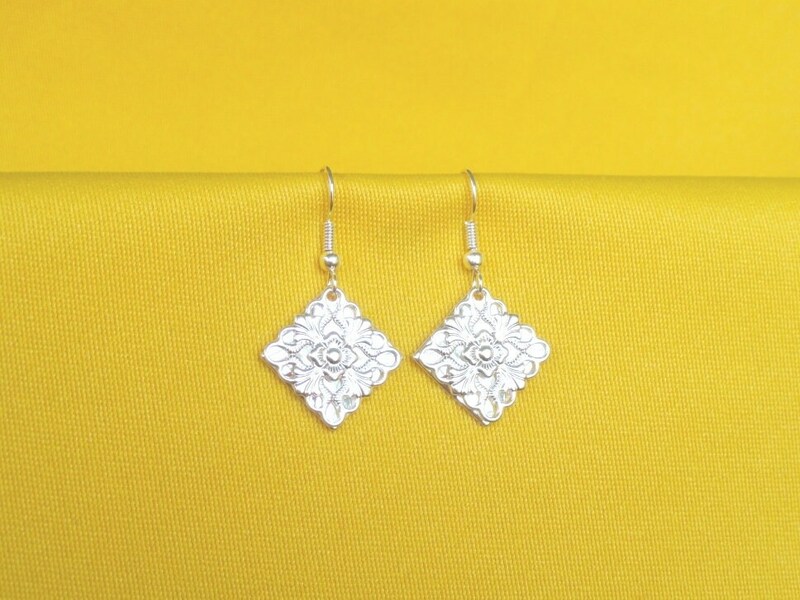 Hanging diagonally from a bright silver stainless steel earwire, a bright silver filigree square sits exactly on top of a bright shiny silver square. You only get a glimpse of the shiny piece through the openings in the filigree piece when the light catches it and then - SURPRISE! It sparkles like there are diamonds! I have never worn a pair of earrings that gets so many compliments! They go as equally well with jeans as they do with your fanciest dress! They have rapidly become our most popular earring style - and they are available in lots of color combinations. I wish I could capture the sparkly beauty of these earrings in these pictures! Wow! Second purchase from Diana is even prettier than the first! Beautiful shiny perfect-size earrings. And the service is SUPER! Little extras like the wrapping paper with gold foil, the sweet bag & the well-packaged earrings, of course. Kudos to Diana! I’ll be back soon. Ordered as a gift, and they loved them! Bought a bunch of earrings with the Mother’s Day discount. LOVE these shiny earrings! Just the right size. Thank you, Diana!